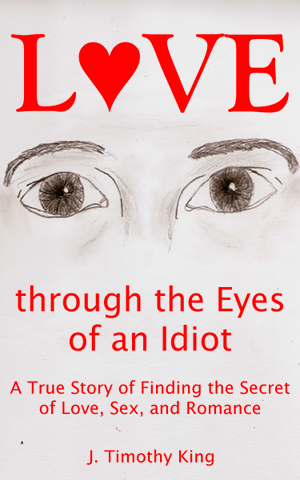 I’m readying for the release of my latest book, Love through the Eyes of an Idiot, the true story of a romantic idiot who was lucky enough to find love. I just finished a first cut of the cover copy. I was born with the heart of a romantic. I fell in love at the drop of a hat, longed for someone to heal my loneliness, always attracted to the wrong women. Like others, I struggled for years with love and relationships. And like others, I thought I was all alone and that there was something wrong with me. I finally did find a special someone, but finding that person was simpler than I had thought. The storybooks have it all wrong. This is my story, the frank confession of a romantic idiot who was lucky enough to find the secret of happily ever after. 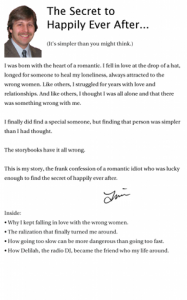 • Why I kept falling in love with the wrong women. • The realization that finally turned me around. • How going too slow can be more dangerous than going too fast. • How Delilah, the radio DJ, became the friend who turned my life around. I’m also accepting advanced readers and reviewers. If you’d like a free PDF copy of the book to review in your blog or other publication, please email me or leave a comment below.